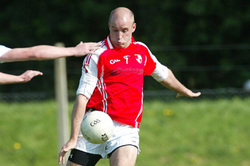 Ballinlough succumbed to a more economical Castletown side in their final I.F.C. match of 2013 in Carnaross on Thursday evening. The score line would suggest that Castletown dominated position and were a far superior outfit, but in truth the only thing that separated the sides was the ability of the winning side to carve out good scoring chances from, at times, a fairly limited supply. For large periods of the game, particularly in the second half, Ballinlough dominated possession at midfield but they lacked the creativity to really test out the Castletown defence. The first half was a cagey affair and it was evenly balance for most part until late in the half when Castletown surged ahead 0-7 to 0-3 but Ballinlough brought themselves back into contention with a couple of Peadar Byrne points and indeed they could of even been ahead if Cian Mallen had converted a goal opportunity. However they were hit with a sucker punch on the stroke of half time when a fairly speculative long delivery went uncontested and it was flicked to the net by an onrushing Castletown forward which left his team ahead; 1-7 to 0-5 at the change of ends. Despite trailing by five points at the break Ballinlough did not throw in the towel and in fact they went on to dominate possession but they didn’t have the guile to create or convert the chances which their endeavour deserved, two guilt edge goal opportunities went a begging as Castletown always kept a comfortable margin between the teams. Castletown now go on to the quarterfinal while for Ballinlough it was disappointment as they failed to make the quarter final proper for the third time in four years.